Japan is probably one of the most amazing countries in the world to visit. However, as any place in the world - it has got its up and downs, and while cruising here and there to provide you the most interesting tech and gadget reports for our 'Made in Japan' section, I’ve noticed some really strange things walking around the city. Here are those strange things. Enjoy! Don't hang yourself up in shops like Tarzan! Yeah, believe it or not, while preparing our coverage for a retro gaming in Japan guide (that we will publish very soon), at the Trader's building (one of the most important video game and DVD shops) in Akihabara we spotted this peculiar sign on the 2nd floor. Well, we do not want to say it was not necessary to inform the visitors that they must not jump, climb and hang up on the ceiling, but we would like to know who did it for real (and get an interview if possible!) forcing the staff to underline it with a specific signal. The truth behind this sign, I think, is that because Japan is preparing this new sport discipline for the 2020 Tokyo Olympics, this sign was deemed necessary to counteract individuals having their own go. While Disney is trying to recreate the magic feeling of the first Star Wars trilogy, the 'oldie' 70's Stormtroopers here in Japan got old, and seems like the (Japanese) Empire has prepared a stable retirement plan for them. These Stormtroopers were spotted at the Makuhari Messe during the Tokyo Game Show 2016, with the pair of fearsome soldiers patrolling the crowd and joining in with fun and games. 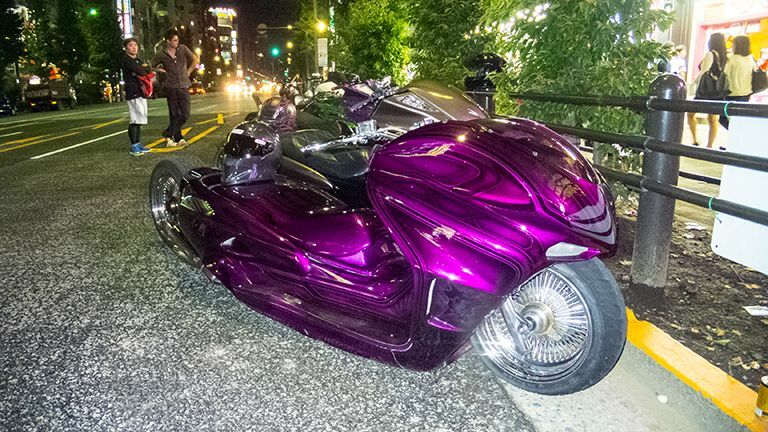 If you want to know how deep the love in Japan is for Akira's motorbike (to be more exact Kaneda's one, the antagonist in the movie), then take a look at these transformed (not just simple tuning) Hondas. Amazing! What we want to know is how it is possible in Japan (known to be very strict on rules) to allow something like so easily, when in Europe it surely would never pass the DVLA's test (Driver and Vehicle Licensing Agency)?! While in Shibuya looking for the 2nd Mandarake shop in the basement, we finished instead at the upper floors of the same building where there is one of the biggest (and best) DJ shops in all of Tokyo (the other ones are in the Ochanomizu area). At one point looking for the exit, between all the rare and expensive drum machines, synths and basslines, we spotted what we never ever expected to see: the Millennium Falcon's sampler! And, what’s more, it doesn't seem to be the only one, because Casio produced it in link with the XW-DJ1 Scratch Disc. Take a look at what this Japanese guy can do with it! PS. We wonder if Lucas knows anything about it? Well, probably one of the most unexpected games ever seen at the Tokyo Game Show, as part of the mobile game's booth of 'Puzzle of Empires', was the "VR Zuen Onsen - Roma version". Without going into too much detail, the core part of the game was to find "something" near the girl sitting in front of you while taking the bath.. enough said! Yeah, in the land of the green tea you can imagine that the 'O-cha version' of our beloved sugar based drinks are available, and they really are! Of course, the beverages taste the same, with the characteristic differences between these two iconic brands the same despite the bright green colouring, but regardless they are a must drink if you get the chance. It’s like being in Star Wars! If you visit T3.com frequently and have perused our Made in Japan section previously, then may already know how advanced the national Japanese broadcaster NHK is with its 4K-destroying 8K technology. Well, when touring Tokyo between meetings here and there, we found our self in front of this peculiar building. Sincerely, I never thought I would see something so strange, especially when I found out it was financed by the government - it is only NHK's HQ! Well, we knew that Japan has its own way of accepting western things, however we did not imagine this. In Japan there are the most iconic characters of the Star Wars saga with re-stylized Japanese suits. As Darth used to say: "Impressive! Most Impressive!" PS. Seriously, I think right now a phone call to George is more than necessary! We do not really know why this was ever installed, with Japan being super advanced in terms of technology, however there are cardinal points inside one of the most crowded and busiest subways in the entire world. As such, if you need to know where in Tokyo the north or the west is, now thanks to the famous Japanese metro you can. Or, you know, you can just look at Google Maps. Your choice. Here we reach one of the best. This sign, in reality, tells passengers to be careful about using their mobile phones in the metro, in case of them being injured when a train pulls in. However, the artwork used is just comedy, with the stick man of choice appearing to be javelin throwing his device into the oncoming train. Yeah, even a national brand or motif of pride and joy in Japan - to be accepted by the Japanese public - has to be modified. A great example is the famous weirdly-flavoured Kit Kats, with me spotting this tea flavoured variety a few months back. So, what’s it like to taste? Awful! Now it is clear why at Ceatec 2016 Japan was so serious about AI and robotics. The Japanese absolutely love it. Everywhere you go in Tokyo, Osaka, Kyoto, you'll find some robot near by. It won't surprise us if in the near future they actually go and develop real robots, as the Gundam Plan wants to.